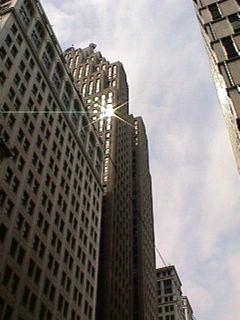 Shot of The Penobscot building, only a few blocks down from The Guardian. Seems the holy light of doom is blooming from the windows up there... no wait that's just that big ole ball of gas we call the Sun. you are here- Vulne Pro Studio's little slice of web real estate; a place where unique ideas, narrative, images, and concepts gestate and grow. We aim to produce original works that only we can do while honoring the spirit of old school classic sensibilities. Please, by all means, feel free to stay a spell! EBEJEEBIES section of Vulne Pro.com updated!